“Over the last year I have gone from teaching a couple classes a month to teaching several classes a week,” Gretchen Phillips, a local art instructor who teaches at Springmoor, shared. “We have had a tremendous amount of growth. The program receives great support from Resident Life Director, Leah Willis. The residents make the work I do here so rewarding.” Gretchen teaches Visual Journaling, Jewelry Design, Fabric Arts and many other mixed media classes. The Meraki Arts Studio (derived from the Turkish word “Meraki” symbolizing creative work as a labor of love) functions as a bright, well-equipped space for all kinds of art. Springmoor residents can blossom creatively, regardless of the level of their abilities. Moreover, substantial evidence indicates the benefits of “creative aging,” and the community embraces this approach with respect to its focus on total wellness. The new studio has individual lockers for residents to store their personal art supplies, a sewing center, a fused glass kiln and a display wall featuring resident artists. At the studio, resident Emily Brown discovered the art of quilling, which is an art form that uses of strips of paper that are rolled, shaped and glued together to create decorative designs. Emily shared how the studio has empowered her creatively. “It has been such a joy to have this added dimension that I had been missing before I moved here. I wasn’t doing my knitting as much and it added a lovely challenging new skill to my life.” Emily has begun designing tiny cards with her newfound quilling creations. Fellow instructor Tommy Midyette also enjoys guiding residents through dynamic, yet achievable images in acrylic. He emphasizes that his classes are suitable for painters of all skill levels. “I’ve been with Springmoor for about five years and we all have a really good time. I’m prepared to answer any painting questions the residents may have because I’m a full-time painter.” Tommy brings the canvases, brushes and other supplies needed for each class. Residents go home with a new painting when the class is over. Contributing to the inclusive nature of the Meraki Arts Studio is that it also welcomes residents’ guests and family members to participate in classes. Residents frequently see children participating and creating art alongside their grandparents, leaving with keepsakes and memories. Furthermore, those on Springmoor’s Wait List can also participate at the studio before they move into the community and many classes are free for new attendees. Leah Willis maintains a full roster of artists so residents have plenty of chances to explore visual arts. Additionally, she uses the community’s art gallery to feature works that residents have created, sparking outreach efforts. 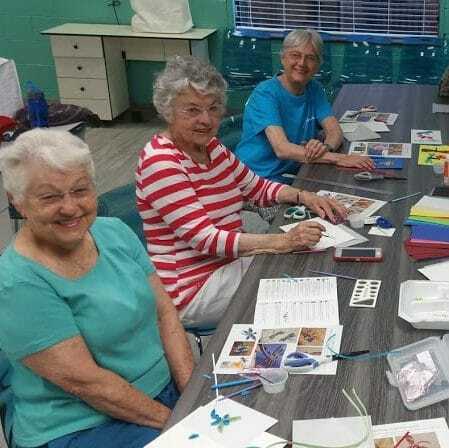 A brochure was recently published for Active Aging Week that highlighted the studio’s one-year anniversary and featured artwork made by Springmoor resident Lavern Wells. Seeing their art on display, in print and in person, lets residents take pride in their creations and reaffirms the benefits of an active arts program. If you would like to tour the Meraki Arts Studio and our campus, please call for an appointment. We would be delighted to show you everything that Springmoor has to offer and answer your questions. We look forward to seeing you soon. 919-234-7626. ← Left Jab, Right Hook, Bam!